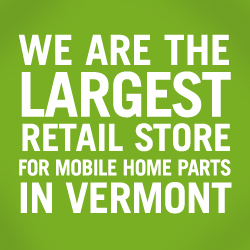 Colonial Mobile Home Supply, Inc.
Colonial Mobile Home Supply, Inc., is a family owned business operating in the beautiful state of Vermont since 1998. We offer fast, friendly and courteous service. We sell only the best products at affordable prices and we maintain a skilled staff to answer your questions. Colonial has built its reputation on our commitment to providing quality products and a dedicated service/repair team to assist you with all your mobile home needs. Please check out our site to learn more about us and how we can best serve you. Hours may vary, so please call ahead.